Hey First Person Shooter, best gaming mouse won’t teach you how to get quick response or make for deficiency of map knowledge, but it surely can bridges gap for you if you are competitive gamer. I am experiencing the market of gaming mice since I started playing FPS games, around 5 years ago. Therefore I am confident about gamers nowadays have much better choices than ever to play their desired twitch-sensitive FPS games. Taking 1000s of votes on different on line polling sites into account we have come with a list of 6 best FPS gaming mice we feel can make the cut. There isn’t any perfectly built mouse for any gamer. With many options available now a days, find what is comfortable and include good sensor and buy it. Do you like to own such noobs in your Battlefield? Here are the voters pick for Best First Person Shooter mouse. 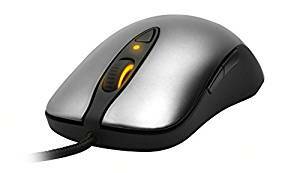 Remember that any mouse on the list may be preferred by some of the gamers on the bases of mouse shape, weight or size. Make sure to give your opinion in the comments section below if you have any disagreement. For gamers who are budget minded, you can check our cheap gaming mice guide for FPS gaming. 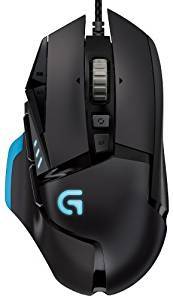 I remember that back in the days, I was confuse when I saw Logitech G502 FPS gaming mouse in the market. Flagship model with a lot of buttons, features and customization had seen failures in pasts. Additionally, Pixart PMW3366DM was not so famous. Why would Logitech G502 be so different? I was wrong, in fact Logitech G502 ultimately overtook Razer DeathAdder according to most of the poll I found online. DeathAdder, or other similar versions from Razer, has been in first place as I begun making all these guides few years ago. I would consider Pixart sensor to be on par with DeathAdder had strangle hold for several years. Logitech PC gaming peripheral are truly down to pat. G502 provides amazing performance features on all fronts. 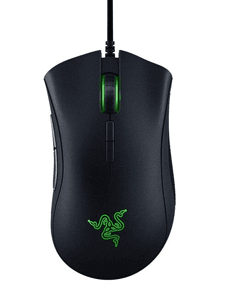 It has 5 tunable 3.6 g weight cartridges to help in enhancing mouse handling. It is designed to give 11 completely customizable buttons for quick access to various input commands on the fly. With maximum DPI of 12000 you can switch sensitivity to 5 levels, from 250 minimum to 12000 maximum at a push of a button. Like all the other peripherals from Logitech, Its GUI is quick and user friendly. This allows you to free reign on mouse button configurations, DPI setting, custom RGB LED colors configurations, and customized macros. The mouse integrates ergonomic and smooth design to offer maximum comfort and extreme handling as well. Wired gaming mouse, if you don’t like cord rattling on your desks look some wireless FPS gaming mouse. Sleek, compact and simple, that is how to best describe BenQ Zowie FK2 FPS gaming mouse. Its minimalist design was chosen to provide an ambidextrous (left/right handed users) FPS gaming mouse. It is a very easy to use gaming mouse and it does not need any special drivers for the installation. It has maximum of 3200 DPI that you can switch between 400, 800, 1600 gears with push of button. Simple design of FK2 doesn’t leave out specific features although, therefore do not expect it to have all such bells and whistles. This FPS gaming mouse is extremely precise with 1:1 movement. 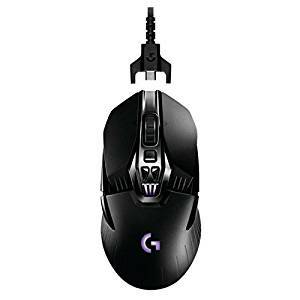 The adjustable report rate of this mouse can be switch between 125, 500 and 1000 Hz to provide maximum level of precision for FPS game sessions. It is designed with claw grip users in mind. It’s large enough to offer comfort for large handed users. Limited buttons, so you will get time to get used to it, especially if you are using gaming mouse with 8 or more configuration buttons. Like other products form Razer, expect this one to spare no extra expense for delivering PC peripheral particularly for gaming It has most powerful features for FPS gaming. It has maximum 16000 DPI that you can change to various rate at push of single button. I advise not to go straight to 16000 DPI because it might be jarring for controlling at first. DeathAdder Elite also include 450 IPS and 99.4 percent resolution accuracy for crucial headshots during FPS firefights. It also incorporates top-notch mechanisms for best tactile response time and feedback. You can expect a life span of 50 million clicks. Mouse overall design is stylish and sleek with patented Razer Chroma lighting for further personalization. It uses 7 fully customizable mouse buttons for quick and easy access to commands. Most flexible DPI adjustment with push of a button. Feels very smooth and can glide perfectly on all surfaces including glass top. Lacks onboard memory to store button configurations. When it is about aesthetics, Steel Series mouse are above all. Its sleek design and durable build makes it ideal long term and reliable FPS gaming mouse. Efficiency and simplicity appears to be name of game with Sensei. Mouse design allows both lefties and righties to easily use this gaming mouse. It includes 7 fully programmable buttons as well as customizable macro buttons. It include 3 zone lights on scroll wheel, on logo and another light to indicate CPI currently in use. Its advanced GUI is overwhelming for beginners however fortunately it offer easy to understand manual downloadable from their official website. I suggest you to read through it first before you try customizing its functions. If you like to customize the lighting then you have to download extra driver from company’s website. As expected form price tag ($100), Logitech G900 Chaos Spectrum is designed keeping eSports in mind. Its design gives you an ambidextrous feel (suitable for lefties and righties). You can choose to use this mouse in wireless as well as wired mode without any difference in performance. If has 5 adjustable gear DPI settings that you can change from 200 to 12000 with push of button. This mouse also has PMW3366 optical sensor for maximum accuracy. In wireless mode, it has continuous 30 hours of battery time on single charge. You can also effortlessly switch to the wired mode through simply attaching USB. It features 11 completely customizable buttons which are perfectly integrated into design with no compromise on its compact design. It uses special mechanical pivot button to give reliable and tactile response and feedback. 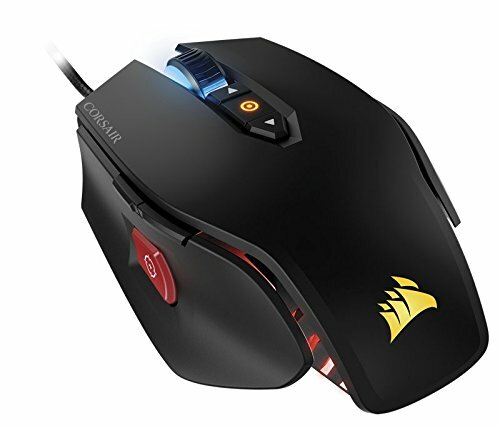 Corsair focuses more on FPS gaming when they make their gaming peripherals and so is true for this gaming mouse, including precision, acceleration and speed. It has smooth well placed DPI switch which goes up to 12,000 DPI and adds smoothness to gameplay on the fly. The surprising fact about it is sniper button that really add a value to FPS gaming sessions. Most if not all FPS mice should have this button. Sniper button is useful for high speed competitive FPS games, like CS;GO and Overwatch. But it really works well in games other than FPS like Call of Duty and Battlefield, because its aiming is slow and more realistic. Its aircraft-grade aluminum structure has real sturdy feeling and quality which make it looks as one of the most stunning gaming mice out there. Aluminum core also add slight weight to it. However you can take it as its pro or con, depending on what you prefer. Mouse grip is best for claw grip users, and fits well unless you have smaller hands. However claw grip can, be slightly annoying in longer gaming sessions, because it does cause some fatigue to your hands. Another downside, is its software, it isn’t very intuitive and slightly illogical. However if you do not mid spending bit of time with its software, you must be fine as it is all about getting used to it. This mouse is perfectly fine when you do not care about its software, and like the plug-and-play devices. It is pretty fine FPS gaming mouse with great overall performance and fantastic specifications. This can be categorized as niche gaming mouse, because of its claw grip, weight and FPS focus. However it also work well for other games. Different sensors perform differently on different surfaces. Additionally, weight of mouse, the way you grip it, and even button placement play factor in accuracy. For most part avoiding mouse that has built-in prediction and acceleration is beneficial. This is particularly important for the maps close to quarters. The optical gaming mice, instead of laser mice, are typically considered more precise as they do not include built-in acceleration. Angle snapping or Prediction can usually be removed by using software. 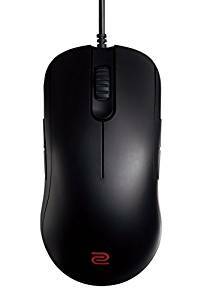 Ideal FPS gaming mouse is one which is comfortable, has extremely precise optical sensors and moves well in on any surface. Finding mouse which fits this set of features has been hard for pro FPS gamers in past. But, as mouse manufacturers understands needs of FPS genre they continue to bring in more options. How you hold your mouse be compared to how basketball shoot basketball. Yes there is an appropriate way to grip it, however there are still few professionals, who prefer to shoot in a way that is comfortable and they are used to. As it can be said that fingertip or palm grips give you more precision or let you have fastest clicking, you must choose your FPS gaming mouse based on grip you can use more frequently or the one that you feel more comfortable. How DPI is Important For FPS Gaming Mouse? It all depend on users’ personal style of playing FPS games. For what you use it, and your screen resolutions. Where DPI confused most if not all people is its relation to precision. Dot Per Inch or DPI is just how sensitive mouse is in terms of movement. For instance SteelSeries’s Kim Ron CMO has stated that most if not all pro games use mouse with DPI from 800 – 1600. This is the case with almost all the gamers out there. 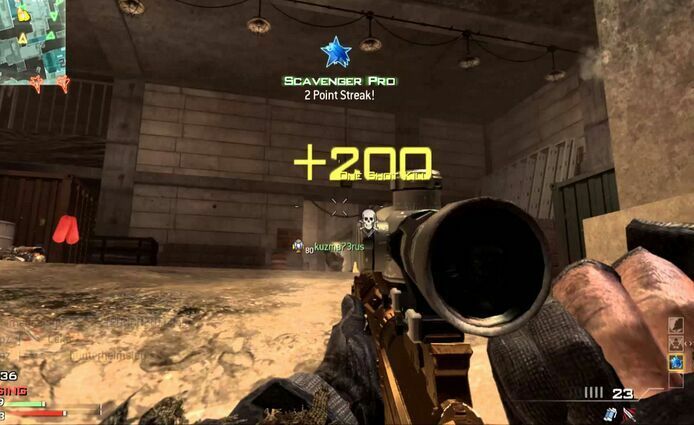 There are some exceptions to this for gamers who uses resolution of excessive 1920 by 1080, however ultimately, an improved sensor and better surface can have more influence when it is about accuracy and precision. There are various more FPS gaming mouse out there, that fits the mold of precision as compared to the mouse that came in the past. Because of this, we really recommend you to value comfort instead of everything else. With wide array of FPS gaming mice with optical sensor available now, you can get best of both of the worlds. Lexip’s 3D Mouse with 2 Joysticks - Failing in "Too" Many Ways! I think Logitech Prodigy G102 also deserves a mention.